RIVFEST IS BACK FOR ITS 3RD YEAR. FOR THE FIRST TIME THE EVENT WILL TAKE PLACE ACROSS 2 DAYS IN MULTIPLE VENUES AROUND WARRINGTON’S CULTURAL QUARTER. 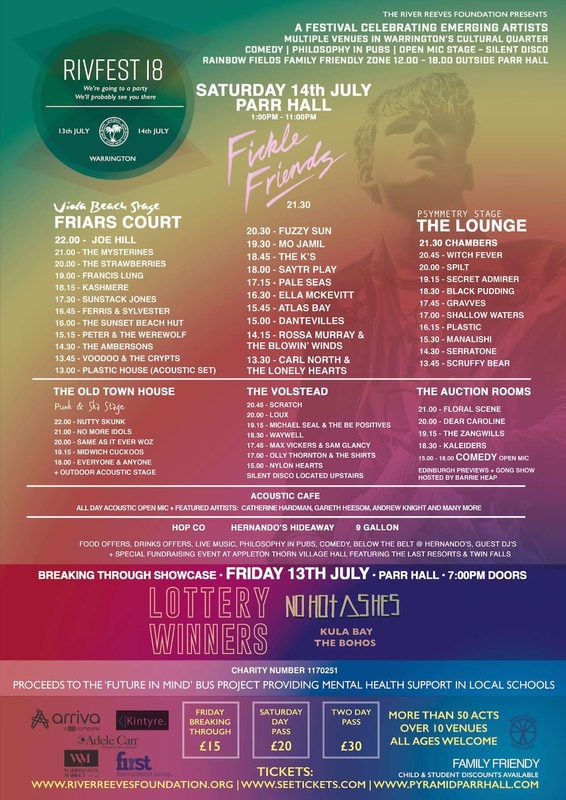 In another first for Rivfest, a new Friday night showcase has been introduced at the Parr Hall to provide a platform for some of the Northwest’s hottest new Indie acts. The event, organised by the River Reeves Foundation was set up in memory of the Viola Beach guitarist River Reeves and his band mates Kristian Leonard, Jack Daikin and Tomas Lowe along with their manager Craig Tarry who all tragically died whilst on tour in 2016. Tickets are available online here for both days, or on the door of Parr Hall tonight and tomorrow. We’re going to a party…we’ll probably see you there!